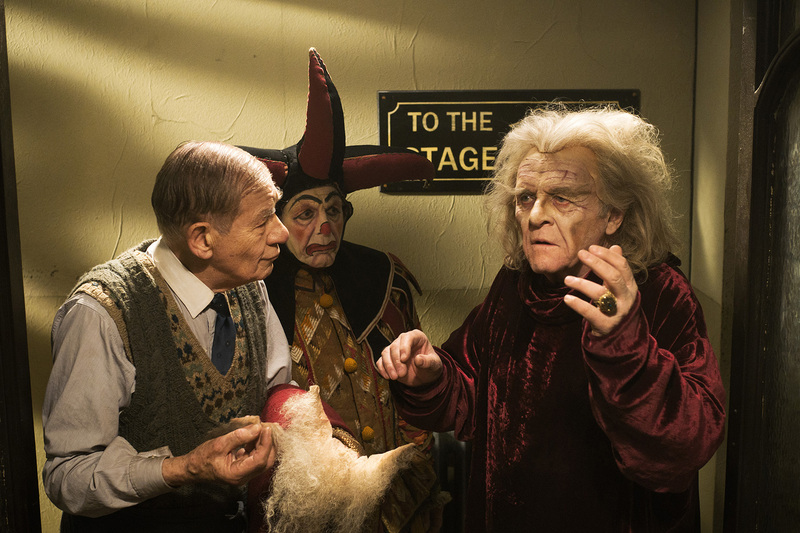 (l-r) Ian McKellen as Norman, Edward Fox as Geoffrey Thornton and Anthony Hopkins as Sir in THE DRESSER. ©Playground Television Limited UK. HOLLYWOOD—Anthony Hopkins and Ian McKellen join forces in the Starz film “The Dresser,” based on Ronald Harwood’s classic play. The play previously was adapted for TV more than 30 years ago, with Tom Courtenay in the title role and Albert Finney as the elderly actor. 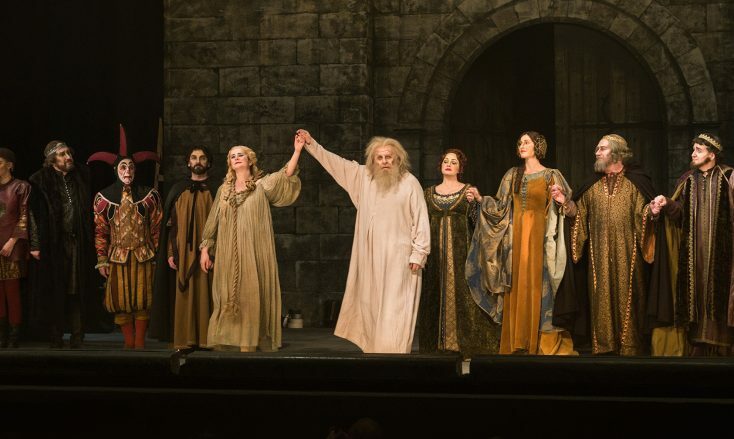 In this new version, adapted and directed by Richard Eyre (“Notes on a Scandal,” “Iris”), Hopkins plays an aging thespian referred to as “Sir,” who is preparing to perform in a regional theater production of Shakespeare’s “King Lear,” during World War II. Suffering with acute stage fright, “Sir” disappears, and it’s up to his trusted dresser, Norman (McKellen), to make sure the show goes on. Hopkins, best known for playing the serial killer Hannibal Lecter in two horror films, candidly revealed during at press conference at the Winter Television Critics Association gathering, that he also suffers from stage fright, which is why he has avoided live performance for most of his career. McKellen, who was interviewed via satellite, said he would welcome Hopkins back to the stage anytime. Q: Sir Ian, Anthony’s character is obviously very dedicated to Shakespeare and bringing him out to the masses. What is it about these classic characters—particularly this character—that are so driven towards bringing Shakespeare to the masses? McKellen: I’ve spent an awful lot of my professional life being involved in Shakespeare with various companies. But I’ve also spent a lot of my life seeing Shakespeare as an audience, so I am one of those who were shocked very early on seeing some of the great actors and some of the amateur actors who have done Shakespeare. There is a lot of Shakespeare being done in the U.K. And the sort of company that Sir (Hopkins’ character) was taking around at a time when I was a young lad, were very precious to us regional audiences. And although the London press might have been rather unkind to someone like Sir—I think he was a bit of a throwback to older times—his audiences didn’t think that. They shared his view, and my view, that Shakespeare, once you discover him, can be right at the center of your imagination. Long may he continue to be just that. Q: Sir Anthony, can you comment on that as well? What is it about Shakespeare that appeals to the masses, that goes beyond just perhaps prestigious audience? Hopkins: I don’t know if I can answer that question. I have an odd relationship to Shakespeare in the theater. I came into this profession by accident, really. I wanted to be a musician. So I came into this as an outsider, so I never really became immersed, although I saw a number of Shakespeare plays in tours. I saw Sir Donald Wolford playing in the “Strong and Lonely,” by Wolford Betty, and actually met Wolford once. I saw Lawrence Olivier and Sir Ian, as Iago and Hamlet, but I never did those parts. I did play Othello, and I played King Lear, and Antony in Antony and Cleopatra, but I had an uneasy relationship with Shakespeare. I had an uneasy relationship in the theater—with myself in the theater—so I skedaddled and came to America. That’s an honest appraisement of my relationship with Shakespeare. But with “The Dresser,” I was intrigued by what particular nature it is that makes actors want to act. Why do they want to do Shakespeare? Why do they night after night go on stage and repeat the same performances over and over? And this play, “The Dresser,” more or less, answers that. You have to go half mad to survive that kind of life. The man I play, Sir, is a man who is obsessed with Shakespeare and obsessed with success, obsessed with the art and obsessed with Lear. I know, as an outsider, my doing “The Dresser” was a painless revisit to a world that I had known for 50 years I wasn’t comfortable with. And now I can understand why Sir and so many actors love Shakespeare. McKellen: Anthony has just confirmed my feeling about this wonderful script. There have been many films, many television shows and many plays about what it’s like to be an actor—the backstage story. Frankly, none of them is any good, with the exception of this one. I think every actor recognizes themselves and their past in this play. If you, as an outsider, want to know what it feels like to be in a dressing room and a desperate performance is minutes away, this play tells you exactly what it’s like. It’s a whole range of character, not just Sir and his dresser, but also the stage manager and the ingénue girl just starting out, and the other people in the cast. They’re all in love somehow with the theater, and it rings absolutely true. That’s why the play has gone on being so successful over the years and on stage, and is now back on screen. Q: You have mentioned what a difficult life it is to be an actor, and you’ve always wondered why actors do it. Was there ever a time when you wanted to quit? Hopkins: It’s not a difficult life. Thank God for it, because the acting profession has given me a tremendous life. It’s not dreadful. It’s not a difficult life, but it’s hazardous, as everything is. Did I ever want to quit? Yes, several times. Every day I think about quitting, but they come up and offer me a job, and I say, “Okay,” because I’m an actor. Even Sir says to the man who asks him, “Have you read my play?” And Sir says, “Is there a part for me in it?” Because we are mad. Somebody asked me a question years ago why I didn’t come back to the theater, and I said, “I don’t know. I feel guilty, because I should. It’s better than working in a car factory, but I don’t know. I’m not quite sure.” And he said, “You know why you feel guilty?” I said, “No.” And he said, “Because all actors want to be loved.” If you go on stage and there are two empty seats, you wonder, “Where are they?” I think that’s in all actors. We want to be loved. We want more. Q: Sir Ian, did you ever want to quit? McKellen: No. What would I do? But one of the thrilling things about acting is that you don’t necessarily have to stop. There will always be some little part for an old geezer in the corner of the script. Anthony and I are really lucky in this that our two characters are center stage in this. The other great thing for me about acting is that I get to work with young people. When I was young, I enjoyed being with the old actors, and now it’s reversed. Not to still be in touch with the world of theater and film and television would be an irreparable loss to me. So, no, you’ve got me for as long and, as I’m mobile, I’ll act. I’m delighted to hear that Sir Anthony wants to come back to the stage. We’ll organize that absolutely as soon as possible. Q: Sir Anthony, there is a line in “The Dresser” where you say, “I hate the cinema. I believe in living things,” which seems to be ironic, given your career in movies. You touched on being uncomfortable in the world of Shakespeare. Were you impatient, or did you want to be loved by many more people than you could be by a theater audience? Q: Did that make you less nervous?